Thank you for shopping The Bookman's on-line store! If you find a title on our site, and wonder if we have it in-stock in our Washington Avenue home, please give us a call at (616) 846-3520. On-line orders will be shipped to your home, office, or gift recipient! Robert Armour's classic text, long cherished by a generation of readers, is now complemented with more than 50 new photographs and line drawings that show the gods and goddesses in their characteristic forms. 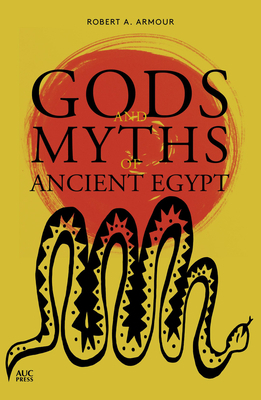 Armour maintains a strong narrative thread with illuminating commentary in his lively, vigorous retelling of stories from Egyptian mythology, including those of the sun god Ra, the tragic death and rebirth of Osiris with the help of Isis, the near-burlesque of Horus' battle with the evil Seth, and the ''gods of the intellect'' Thoth and Maat. Now with an updated bibliography and glossary as well as new charts showing the gods at a glance and ancient Egyptian chronology in brief, this book is sure to inform and enchant a new generation of readers. Robert Armour is professor emeritus of English at Virginia Commonwealth University. During 1981-82 he was Fulbright Professor at the universities of al-Azhar and 'Ain Shams in Cairo. He has written or edited six books.